After reading this fantastic post last week, I started thinking about how startup founders will sometimes jump into an idea they’re excited about. The problem is, many of them have no idea how to research it properly. I’ve seen quite a few people start a company thinking of the riches that will soon be theirs, only to realize that their idea isn’t going to work. I almost had the same thing happen, but instead went through a serious process of idea research, which I cover below. Instead 0f spending 3-4 years of my life working on something with a high likelihood of failure, I’ve been able to do some other cool stuff. The basic idea was this. College tuition is ridiculously expensive, and different people receive different value from their educations: a computer science student from Harvard has vastly different earning/job prospects than an English major from the same school. However, these two students pay the same tuition and borrow money at the same rates, which are based on family income. In financial terms, a student with an engineering major from a top 50 university is a low risk for default, but priced as if they defaulted at the same rate as English or other majors. Thus, the idea was to give lower-interest student loans to engineering students – they’d receive a cheaper education, you’d receive a solid return from a low-risk asset. 1. Could I create something more valuable than what currently exists? 2. If yes, could I reach people to make them aware of my superior product/service? 3. Assuming things go well, could I make enough money to run an interesting business? To answer whether or not your idea is better than the competition, you need to do some competitive research. Since most people start a company based on an idea (and not the size of the potential market), that’s where we’ll start. Your idea should have competition in some way, shape or form. Mine certainly did. If there’s no competition, it might be a sign that there’s no market for what you’re doing. In this step, you want to answer question 1: Can I create something more valuable than what currently exists? The fastest way to find your competitors is to do a Google search for a relevant market keyword. For me, it was “private student loans”. Take a look at the Google AdWords that appear with your results. Any company with an ad budget (and thus an ad) means they’re likely a serious player – they have money to afford a marketing budget, and probably some idea of what it costs to buy a customer. By clicking through each of your competitor’s Google ads, you can also see how they position themselves on their landing pages. What benefits are they selling? Are any of them claiming the same benefits you’d be bringing to the market? This is a good sanity check – if some of these competitors do the same thing you’re planning to do, it doesn’t mean you have a bad idea. You could still out-execute them on distribution, or have a better product. After looking for competitors, I found that SoFi and Upstart were doing somewhat related things, on top of the many banks that do private student lending. Once you know your competitors, it’s important to then get a feel for their company strategy. The way I usually do this is by looking at their jobs page. Depending on what positions they’re hiring for, you can figure out the direction they are heading over the next few months. For example, based on the campus ambassador job at SoFi, it looks like a key part of their growth plan is to have campus reps get fellow students to use SoFi. I also checked out the Crunchbase for both companies, and saw that SoFi raised $77 million to roll out their lending program to other MBA programs. Based on this (and a careful reading of their company website), I figured that they are planning on giving out loans themselves, instead of just connecting alumni and students. This is a big deal, because it means that they were likely struggling to get alumni to fund students OR they realized that being a market intermediary wasn’t a good spot to be in. As you’ll see later, this was red flag #1 with the idea. At the end of this stage, you should know three things: who your biggest competitors are, the basics of their company strategy, and how you are (or will be) different from what they’re doing. If you think your approach has more value, time to dive a bit deeper. Now that you know you’ll bring more value to the market than the competition, it’s time to figure out if you can reach your potential customers. Researching how you will acquire customers (and how your competitors do) is rarely done. This is unfortunate, because it may be the most valuable part of your research. Having a rough idea of how much it will cost you to acquire a user informs just about every major decision you’ll make – what you’ll charge, how much you need to raise, how much of your marketing spend should be on advertising, and what marketing channels you should test. Luckily, with all the free tools available you can get a really good idea of how your major competitors are driving customers. First, you can use Google Trends to look at the popularity of your competitors in the space. Who has been mentioned more often over the last months? What blogs/media outlets have covered them? Doing this will give you a good idea of the blogs or media outlets that would be receptive to running a story about what you’re doing. This type of information is really important. Early on, while you’re still figuring out what you’re doing, copying competitor’s distribution channels is a good way of getting some early traction. Next, you want to look at your competitor’s (likely) two largest sources of traffic – paid advertising and organic search. One of my favorite tools is SEMrush, which you can use to get an estimate of your competitor’s search engine traffic, organic keywords that are working for them, and where their traffic is coming from. In the case of SoFi, I was able to see that they did no advertising, and most of their search traffic came from people specifically searching for “SoFi” or related terms. From this, you can see that they have made SEO a focus of their strategy, and are working on expanding to other countries through paid search and organic SEO. That’s a good thing to know when figuring out how to attack the market. It means that you’ll have to do a really good job executing on SEO, or choose a different vertical. 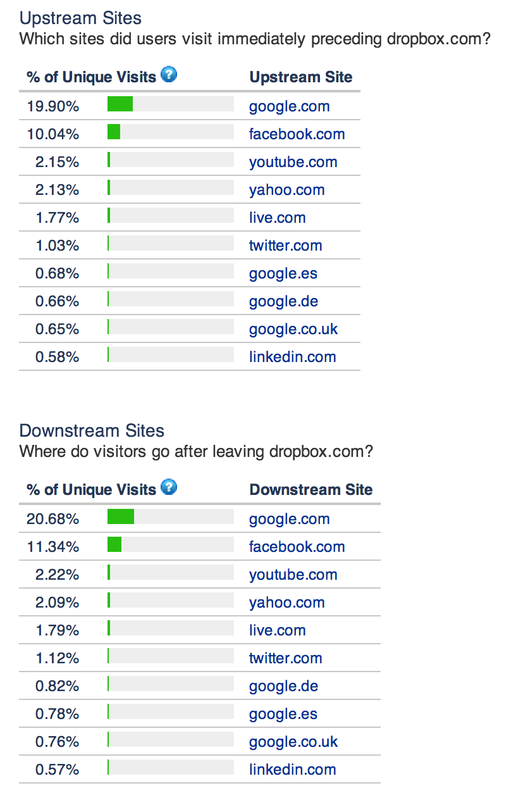 This information tells you that Dropbox is doing a good job of driving traffic via Facebook, that Youtube accounts for a surprisingly large percentage of their visitors, and that they have many people searching for them in Europe. Overall, if I was looking at starting a file-sharing competitor, I would write off SEO as a channel through which I could beat Dropbox. They’ve done a great job, and it’d be extremely difficult (and take a long time) to achieve the types of rankings and traffic they have through SEO. Open Site Explorer to see where they get their links from. Sign up for a free trial of SEOmoz to see where the competitors rank for different terms, and determine how hard it would be to rank for certain keywords. Take the free trial of HitTail to see if there were potential opportunities to rank for certain longer-tail SEO keywords. Lastly, I’d use the Google Keyword tool to figure out how much it’d cost me to buy search advertising, and see how much my competitors are paying for certain search terms. If it’s a lot, I now know that advertising may be a difficult way to acquire customers, and start looking at other channels. At the end of this process, you should know a few things: how much traffic your major competitors are getting, where that traffic is generally coming from, what sites have linked to them, and an idea of whether or not SEO and PPC could work for you as acquisition channels. If not, start thinking about others – viral, partnerships, PR, etc. Starting a company with some idea of how you’ll attract customers vastly increases your chances for success. Who are the major players in the space, and what is their total revenue? What is their market cap (if public)? Here, use the 10k’s of publicly traded companies to research total revenue, profits, expenses, and profitability history. Pay special attention to net income and expenses – where are they spending the most money? Are their profits growing or shrinking? Why? What are people saying about the industry? What are some recent blog posts or press covering the market or its major players? Use Google’s search tools to see most recent blog posts or press mentions over the last month. How often is the market covered? Who covers it, and what are they saying about the market and the companies in it? Is it a growing market? What gaps exist that I can leverage, and how entrenched are the players in the market? Here, look for industry reports and revenues of companies in the space. Also use Crunchbase to see if other companies raised money at increasing valuations in the past 6 months. That’s a strong indication that they’re seeing some kind of growth. What do my potential customers care about? Use Delicious to see what popular articles people have tagged as memorable. What do they care enough about to save? For example, if you are thinking of doing a web analytics startup, take a look at some of Kissmetric’s most popular posts to see what people are interested in and found valuable. At this point, I also set up Google Alerts for certain key terms in a market. For example, with our hypothetical fire-sharing competitor, I’d create alerts for the top 3 competitors and a few key terms (e.g. “file sharing” + funding) I wanted to monitor. I’d also subscribe to a few relevant blogs that covered the space, and follow relevant players (and reporters who cover them) on Twitter. In the case of a file-sharing company, I’d follow Aaron Levie, the CEO of Box, Dropbox’s CEO Drew Houston, and a few TechCrunch reporters that you can see often cover Dropbox and the file-sharing space – Josh Constine, Sarah Perez, and Ingrid Lunden. You can also do some basic market sizing by using Facebook ads to determine how many people are in your potential market. Noah Kagan talks about that in a great post here. Lastly, get out of the building and talk to people. Having conversations with industry experts will expose you to problems and ideas that you can’t find on your own. Often, these people will be happy to talk to you – in my case, I even had one guy who wanted to invest after I did some of my research. In the end, I passed on the idea for a few reasons. The largest one was the numbers didn’t make sense: starting a company that connects alumni or other institutions to engineers who need student loans is a great idea if you collect the 1-2% spread between private loans and what you could offer. If I had $50m+ I’d do this in a heartbeat. Otherwise, as a middleman, you’re only getting a small piece of the 1-2% differential between the loans you’d facilitate and the rates students could get elsewhere. You have to have a LOT of volume to make this a worthwhile business – even if you facilitated $500m in loans (about 16% of the total market), you’d still only make $5-10m annually. So, the math didn’t make sense unless you were the one actually giving out the loans (the strategy SoFi seems to be taking). I thought about it, and given my status as a 23 year old recent grad, I didn’t want the potential success of the company hinging on whether or not I could raise $50m+ in capital to lend out to engineering students. When you account for regulatory and legal compliance issues that come with being a lender, and the idea just didn’t make sense for me to pursue at the time. The last piece of this was a few conversations I had with people in the space. A few people I spoke with saw the opportunity, but didn’t think it could be a major business given the economics of the market. Additionally, SoFi has a mature and well-connected team of executives that I wouldn’t want to compete against in a market that will be rapidly changing over the next 5 years. If the price of college collapses, and the education bubble pops, SoFi is in a tough spot where they have to process more and more loans to reach the same volumes. Even if the cost of college drops 10%, that 10% has a big impact on the loan volume they can process. In the end, it’s an idea I could have raised money for. I had a few people who said they were willing to invest, and a marketing plan that I’m confident would have worked. However, thanks to intensive market research lasting 2 months, I think I saved myself years working on an idea that likely wouldn’t have paid off. Want access to the competitive research spreadsheet I use to evaluate a startup opportunity? Sign up for my (very) infrequent email list. Great post Justin, and thanks for the mention. I think it’s substantially easier to tell if there’s a market for your product/service if someone’s already doing it. However, you can potentially take over a space a lot easier if you’re the first one in it. It’s a lot harder to do, so the chance of failure is a lot higher, but your ceiling is also a lot higher since you basically control the market until someone else goes in. I’m working on something currently that no one in the space is doing— I go in knowing it could fail, since I basically can’t do 100% of the due diligence I’d like to do. (since it doesn’t exist) However, if it works, it could work in a big way. In those situations you just calculate the EV and make your best judgement. Re: the people you’d follow— I don’t know much about Aaron Levie, but I follow him and he impresses me a lot. Extremely smart. Great person to follow. Thanks for the comment. Good point, and something I should have addressed. Though I’ve also never entered a market without competition in some way so I don’t know much about it. Good point. I’d look at some sports-based games companies to get an idea of how they’re doing it. How are they acquiring users? How are they growing and retaining them? With such a saturated and stagnant market, it could be good to shake things up as well. Doing something like building a small tool (ex: a virtual trophy for people who won their fantasy leagues, or some free semi-viral giveaway to attract email addresses) might be an effective approach to get a few people interested in fantasy, and then leverage that audience to grow. Partnerships with fantasy blogs might also be a good one. I would spend a lot of time looking at other acquisition channels outside of paid advertising, SEO or content marketing. Those seem pretty saturated by the big guys. Find out what unique value you’d offer, and then a way to reach as many people interested in fantasy as possible. great you are working amazing work. if you need more article writing techniques please visit my page here. Loved this post Justin. Another issue that you probably would have reached is that a college freshman planning to major in CompSci or Engineering has an X% probability of graduating with the same major (where X < 100%). That makes it easier to start with the grad market (which is where both SoFi and CommonBond have focused to date). Good point – thanks Dan! Google SketchUp Pro 2018 Crack is 3D draw tool. Try having some fun while you’re at it. SketchUp does not give up the usability for the sake of functionality.